SIGMA Multiplace systems are designed to specification for hospitals expecting high volume or significant critical care requirements. Customized patient capacities, internal diameters and a wide variety of accessories make each system unique. A free-standing operator control console with color video monitors is included. The Perry Multiplace Systems series is available in standard 2,3,4,6,8,12 or 18 patient configurations, or custom designed to meet larger patient requirements. Our multiplace chambers permit treatment of seated, supine or wheelchair patients. Dual or multiplace compartments allow for a variety of simultaneous treatment protocols. 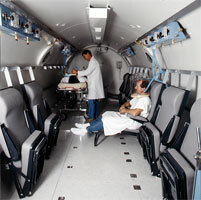 Our standard large multi-place system provides a minimum of 100 cubic feet for each seated patient. A floor level, rectangular entrance door to the main treatment compartment allows gurneys and wheelchair access with ease. Ergonomic cushioned seats with armrests, cervical and lumbar supports, and fold out footrests increase patient comfort and two attendant jump seats are included. The entry lock permits a physician or attendant to enter or leave the system during treatments, allowing for treatment of the acute patient. The Sigma MP Series reduces staffing requirements per patient while increasing the number of patients that can be treated simultaneously. These units are designed by our staff engineers who have extensive industry experience. 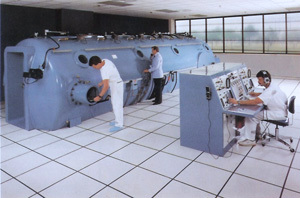 Perry’s expert engineering team will assess each customers’ individual needs, and assist in designing the most appropriate and efficient hyperbaric facility possible. 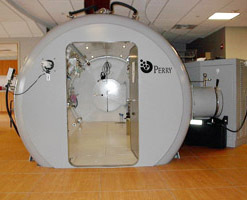 Perry Baromedical, upon request, can also manufacture and supply hypobaric chambers, useful for altitude training and other specialized reasons. Please contact Perry’s engineering department for further information on this option.